Well this has escalated quickly! I now used aluminum foil that you can buy anywhere at any shop (comes in roles and it’s used for wrapping food). This is thiner than candy wrap foil and allot more stubborn!! 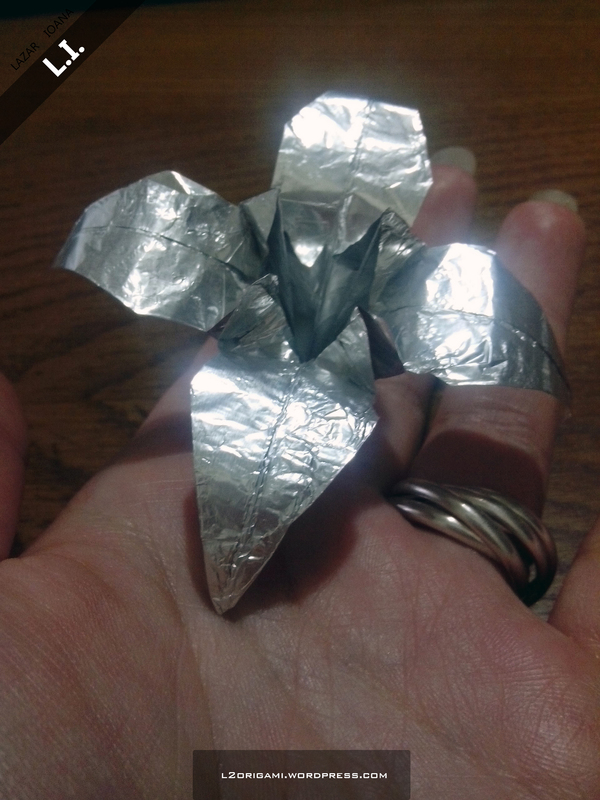 – can not be used for origami designs that require inflating! So here is some of my test origami 🙂 a bow and a flower! 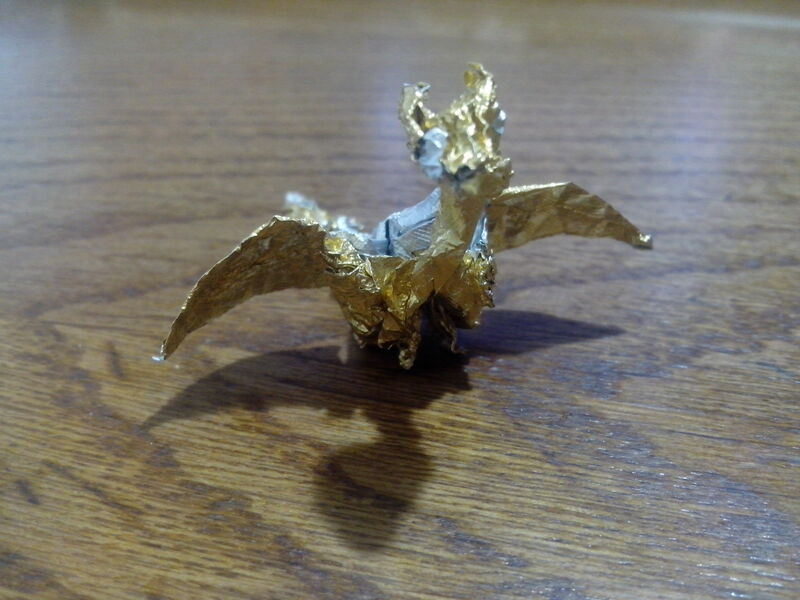 I made this tiny Fiery Dragon (by Kadechan) dragon from a Ferrero Rocher candrywrap aluminum foil. 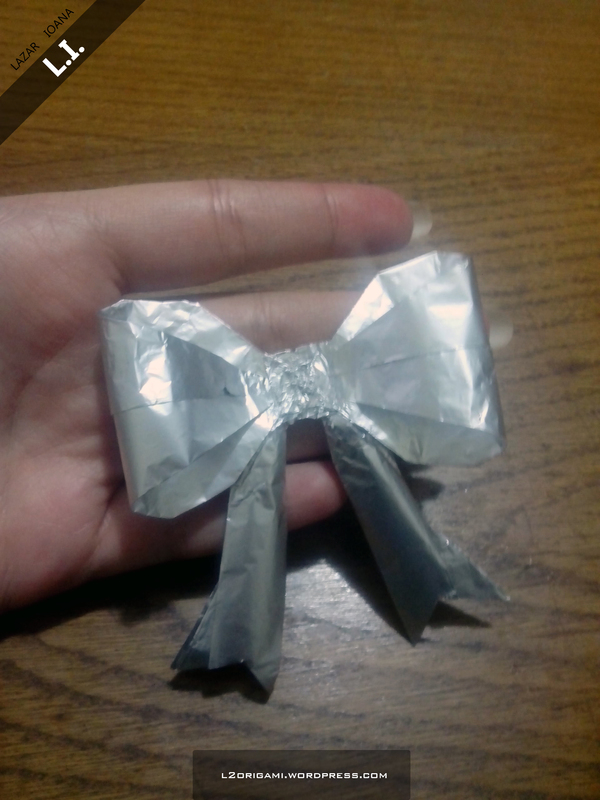 It was 10×10 cm after i cut a bit of it out and tried my best to straighten the foil without ripping it. I made some mistakes by letting all that silver show, but it was a small model. So sorry about that! But it has all the parts: feet, little hands, wings, tail, head with horns. 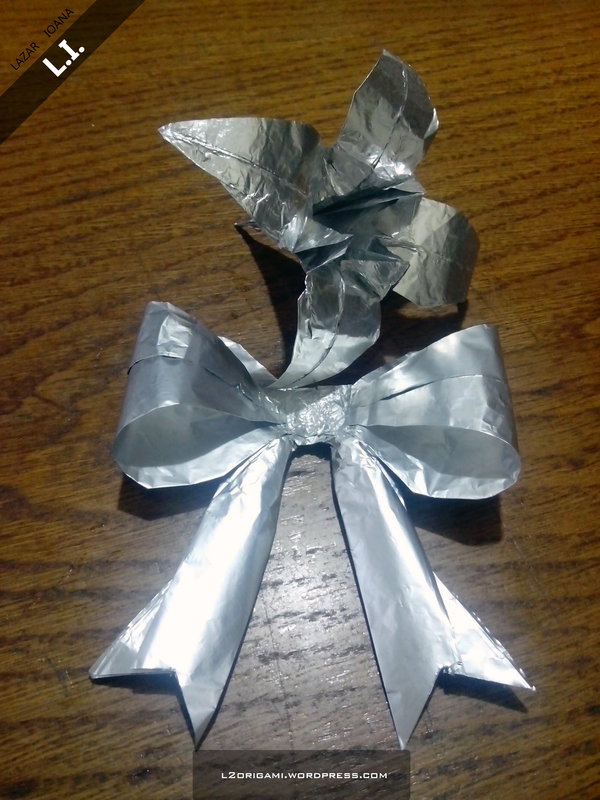 It is strange to make origami from metal but the foil is so interesting to fold. Most of the pre-creases disappear so you have to either know the model you are making really well or have a good intuition on where they should be. Also, if you are a girl and have long nails it helps allot to fold with metal. If not get a paper clip or a blunt needle or something that won’t perforate the thin foil. 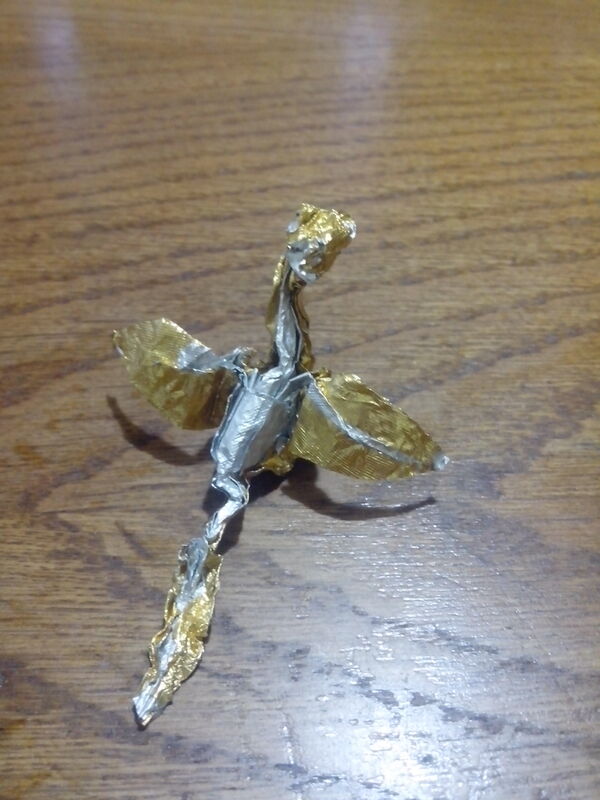 More complex origami such as this Fiery Dragon you should already know all the folds, it helps allot. Took me about 1 hour to make this lil’ guy but i love the way he turned out. Next time I will try using bigger foil. Food wrapping foil is also good, only bad side being that it’s only silver. 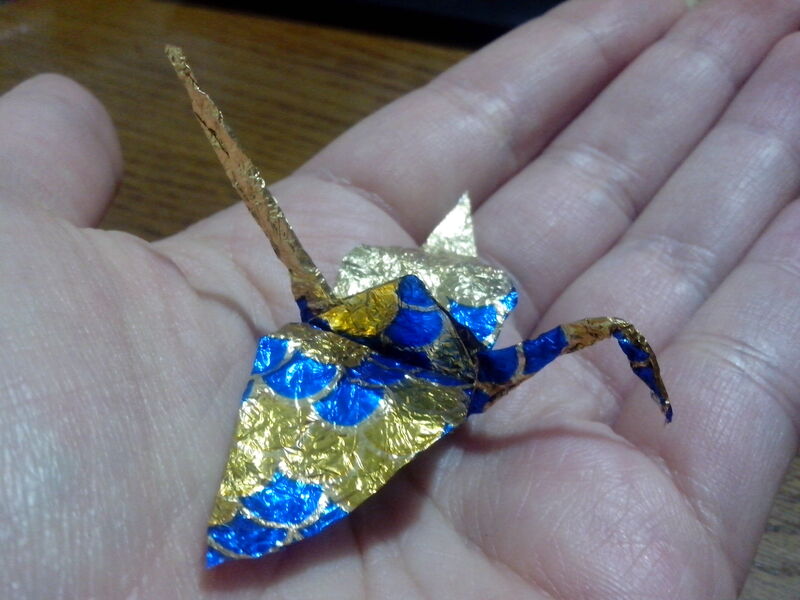 I have also compared it to the smallest dragon I have made from paper (5×5 cm square). 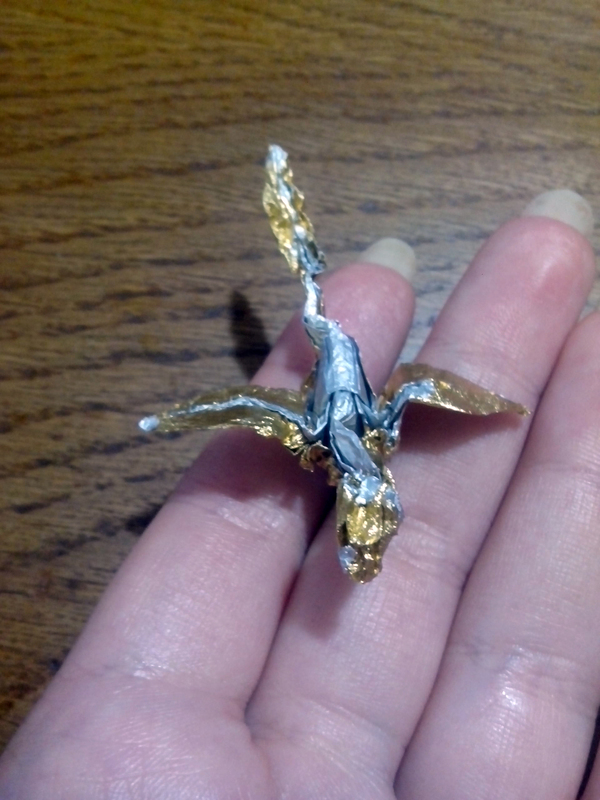 So I made an origami crane from a piece of aluminum wrapping foil from a candy 🙂 turned out pretty neat!